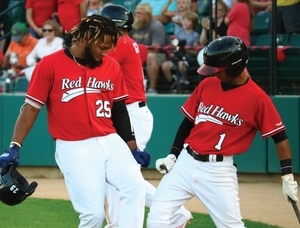 FARGO, N.D. — Tim Colwell’s heads up baserunning in the bottom of the seventh inning earned the RedHawks a 4-3 win over the Chicago Dogs in the first ever meeting between the two teams at Newman Outdoor Field Monday night. Both teams plated two runs in the second inning to get the scoring started, and Keury De La Cruz crushed his 11th homer of the season and second in as many games over the right field wall in the third to give the RedHawks a 3-2 lead. Chicago tied the game at three after loading the bases in the seventh inning, but two straight stolen bases and a scamper home on a wild pitch gave the Hawks the 4-3 lead heading into the eighth. Fargo-Moorhead starter Brandon Barker held the Dogs to three runs on five hits over 6.1 innings on the mound but did not factor into the decision after he left the game in the seventh inning. Travis Ballew earned his fifth win of the season with 0.2 innings in relief in the seventh. Ballew gave up one hit and walked one to move to 5-2 on the year. The reliever leads the RedHawks with 38 appearances on the mound in 2018. Geoff Broussard came on in the eighth inning and finished the game for the two-inning save — his fifth of the season. The RedHawks picked up a game on the Gary SouthShore in the North Division standings thanks to the RailCats’ loss to Lincoln tonight and now sit one half game behind Gary for the lead. Fargo-Moorhead will look to continue its two-game winning streak tomorrow night at 7:02 PM in the second of three games against the Chicago Dogs.